Apparently, Samsung’s new wireless earphones were not indicating the battery percentage correctly. The new update fixes this issue. You should see the accurate battery percentage in the Galaxy Wearable app going forward. The update also fixes a bug in the ambient sound menu. This is about the function that adds surrounding sound to your music, so that you know what’s going on around you. Lastly, the new update brings a more stable Bluetooth connection, though we cannot say we had complaints before. To update your Galaxy Buds, open the Galaxy Wearable app while the buds are connected to your smartphone. A pop-up should appear if an update is available for your Galaxy Buds. 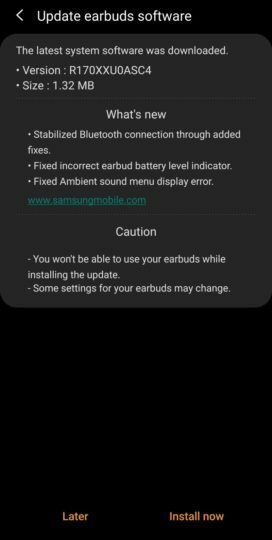 You can also manually check for updates by going to the Galaxy Buds section of the app and then tapping About earbuds, followed by Update earbuds software, and finally, Download and install. Have you updated your Galaxy Buds to the latest software version? Do let us know if you notice any difference after the update. Not fixed yet even i updated it that 1.32mb update and still both are at 95% when i start listening songs and after sometimes my left one is at 75% and right one is at 90% something wrong within their algorithm needs to be fixed properly. Noticed the battery percentage is shown only in increments of 5. Maybe due to used batteries in Buds we can’t see the exact battery level ? Delivered an hour ago! Can’t wait to get home! Just got it. Man, I love the Buds. I bought Galaxy Buds and tied them on and they are uncomfortable when I speak on a phone call (I heard myself vibrating) so I returned them.